Appearance : Adults measuring from 1 to 2 centimeters long. Their body is covered with a shell or cuticle, bright tan. Very elongated, it has two long antennae. Earwigs owes its name to its abdomen ends with two tails in the shape of a clip. Habits : During the day, earwigs, lucifuge (fleeing light) spends most of his time in the crevices of the soil under the bark of dead wood in the hollow between the flowers or petals of large flowers (roses, for example, ). At night he comes and goes in search of food. 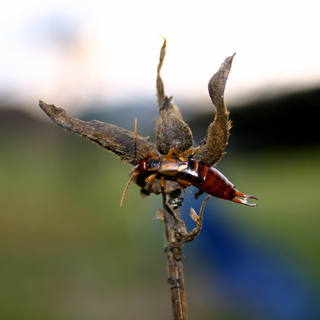 Nourishment: These bugs are basically vegetarian, but they can feed on insects occasionally. Reproduction : After mating that occurs in summer, the female lays eggs. Larvae will adult a few months later. The female seems to care little. 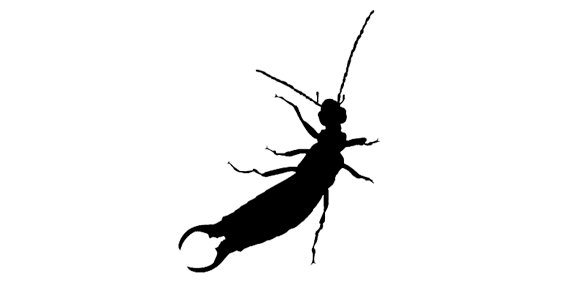 In the early fall frosts and cold (around October), the earwig burrows into the soil to hibernate. Most males die in the winter, while the female survives the year. A month later, it digs a little box (terrier) isolated and it lays a few dozen white eggs, round and translucent (maximum sixty). Around mid-May the larvae hatch. The female takes care of the eggs and larvae with attentive care until the last of the four moults suffered larvae resemble adults, but smaller and without wings. Young adults usually emerge in July. They remain active until the first frost.